C.T. Jasper is a visual artist, born in Gdańsk in 1971. His works oscillate on the threshold of various media, concentrating principally on video and electronic-partisan interventions in already existing films. The artist splits his life between New York and Ulan Bator. Visual artist working primarily with video. All Jasper’s projects reveal his interest in film and the variety of contexts in which it can function, such as screening it in a three-dimensional space or using it as a different indirect reference to the field of film-making. In his complex works, Jasper creates architecture of the void: a deserted space devoid of elements of life. The architecture can also be interpreted in existential terms - as a reflection of the state and the condition of a human being. The very shift towards architecture reveals Jasper's fascination with the history of urban planning, construction and interior design, which determine human behavior and have direct impact on human lives. One of his earliest works, Erased, is an installation built on the basis of sound, architecture, and three videos. It was a unique intervention that challenged the mission of an art gallery and was first shown at Le Guern Gallery in Warsaw. A deserted space, isolated from external stimuli, became a place for two video projections. C.T. Jasper interfered in two cult works of world cinema: Blue Velvet by David Lynch and The Tin Drum by Volker Schlöndorff. He digitally erased all the characters from the fragments of the original films which resulted in corridors, floors, the opening of a door, and a table set for a meal turning into the main protagonists of the videos. The audio track of background sounds (clattering, squeaking and rustling) facilitated following of the plot. The film and exhibition area merged into one space suspended between a vacant cinema, a deserted film set and a gallery. The third video, played separately on a computer screen in the gallery’s staff room, was looped footage from Stanley Kramer’s 1995 post-apocalyptic drama On the Beach. It showed a telegraphic device sending out a Morse code message tapped on an upside-down Coca-Cola bottle. This cryptic message is one of the few sources of hope for survivors in a world devastated by nuclear fallout. It is only when they reach the source of the signal that the survivors realize how wrong they were. In 2015, the work was shown at the Museum of Art in Łódź at a joint exhibition with Joanna Malinowska entitled Związki rozwiązki/ Relations Disrelations. This time, it was supplemented with new meanings. In the museum halls, the installation questioned the notion of site-specific works which theoretically function only in the particular place they were created for. In this context, Erased problematized the issue of a ‘faithful’ reconstruction of the work and, in a broader sense, the possibility of transferring a bodily experience of architecture of the void from one place into another. In the Dust of the Stars is a limited edition series magazines featuring topics related to the film and cinema industry. Whilst they have great potential for shaping the imagination and distributing information, magazines are also being used as tools for manipulation and propaganda. In this work, consisting of framed film magazines, C.T. Jasper works through the concept of archiving and the phenomenon of recycling ‘old news’ mixed with fiction. The project touches on the uniqueness of limited copies and the issue of mechanical reproduction. 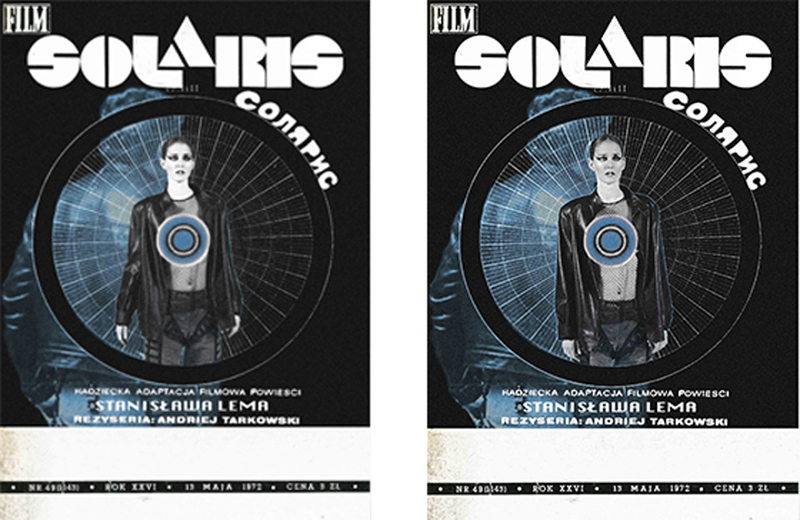 The individual elements consist of a pair of nearly identical film magazines from the communist period in Poland such as Ekran (Screen), Film and Kino (Cinema) altered by the artist. C.T. Jasper investigates the ideas of the future disguised in the ‘costume’ of science fiction. He seeks to figure out whether science-fiction fantasy can propel the dreams of the future. He wonders whether it can become a tool of propaganda or a means of subversive expression. The title of the work In the Dust of the Stars (Im Staub der Sterne) repeats the title of the science fiction film produced in the German Democratic Republic in 1976, which under the pretext of a fantasy story about aliens tackles with the issues of slavery, danger and exploitation. In the works, such as PLAYTIME (2015) C.T.Jasper explores the ideas about modernity inspired by films and visual culture of the 20th century. This installation is composed of seven unique objects. 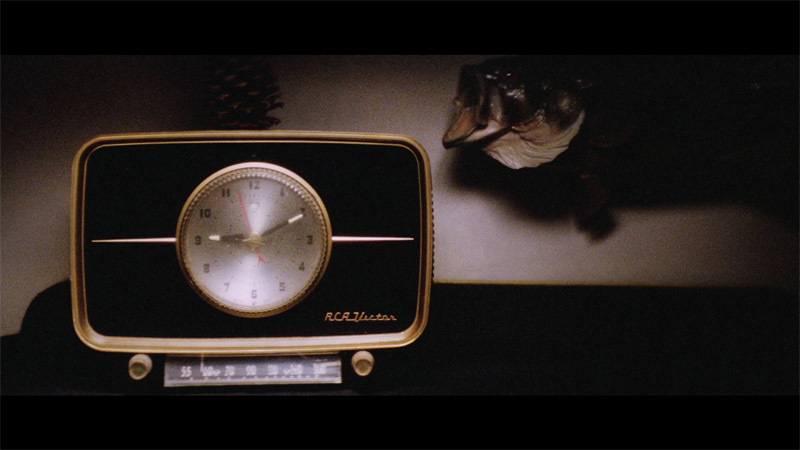 The furniture and domestic appliances, such as ashtray or lamp, are the replicas of the objects from the film featuring advanced technology titled Playtime (1967). Its director, Jacques Tati, attached great significance to the architecture and choreographic movements of the characters lost in a designed world. C.T. Jasper, inspired by Tati’s work, arranged museum halls as the set of the film in order to analyze the movement of viewers in the exhibition space. As in Tati’s film, the appearance of modernist elements of life do not necessarily go hand in hand with the comfort of use. Through the ambiguous status of the objects, which turned into works of art and design fetishes, C.T. Jasper casts doubt on the question of their functions. He displays the utilitarian objects as ‘exhibits’ in the museum - an institution which for centuries has been developing disciplinary rules of conduct for the public. PLAYTIME also raises questions of how artistic work inspired by film affects people in a given space and how the space from particular film, which in terms of the art of film-making functions as an unreal place, reproduces the tangible world. James Voorhies, in his essay Something else, something more than merely an exhibition or film: the art of C.T. Jasper claims that the exhibition space is an integral catalyst used by the artist to engage the audience in the film space. He considers it a new sensory experience. The strength of this work results from the juxtaposition of the exhibition space with that of film. From the very moment of entering the exhibition, the audience experience a state of confusion and curiosity [...] Being in the joint space of the installation and film creates new mode of cinematic exposition. 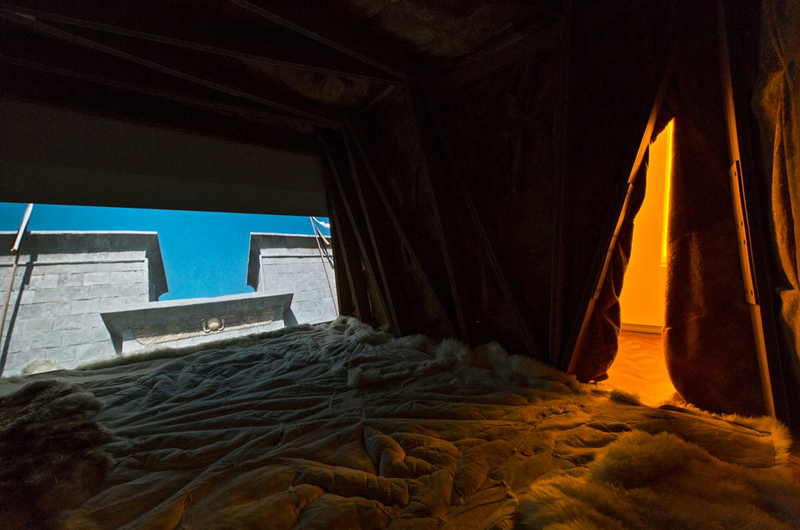 Similarly to the installation Erased (2012-2013), in the Sunset of the Pharaohs (2014) prepared for the Frieze Art Fair in New York, viewers are exposed to the experience of architecture of the void designed by the artist. Once again, C.T. Jasper has digitally erased all of the human figures from a 60s feature film, giving it a new quality. The installation enables viewers to focus entirely on the set design and the interiors in which the story takes place, provoking them to reflect on the art of film-making and to actively participate in fiction and reality experienced in three dimensions. According to James Voorhies, the aim of such action is to expand the forms of film within the exhibition space. While Jerzy Kawalerowicz’s 1966 film Pharaoh provides the material basis for Jasper’s work, in the context of the Arab Spring and its inconclusive aftermath, the film’s structure and narrative become particularly topical. Even as the far-reaching socio-political effects have been felt across the globe, the process of revolution in the Middle East is ongoing. Jasper’s Sunset of the Pharaohs provides, then, a timely, critical context for the processes of reading, writing and rewriting history in a mediated culture. The architectural structure clad in tanned sheepskin recalls a nomadic lifestyle and it is also highly suggestive of a camera’s bellows – a device for increasing the focal length of the lens which enables precise exposure of a detail or the whole scene. One of the most recent works prepared for an exhibition at the Museum of Art in Łódź is Vertigo(2015). 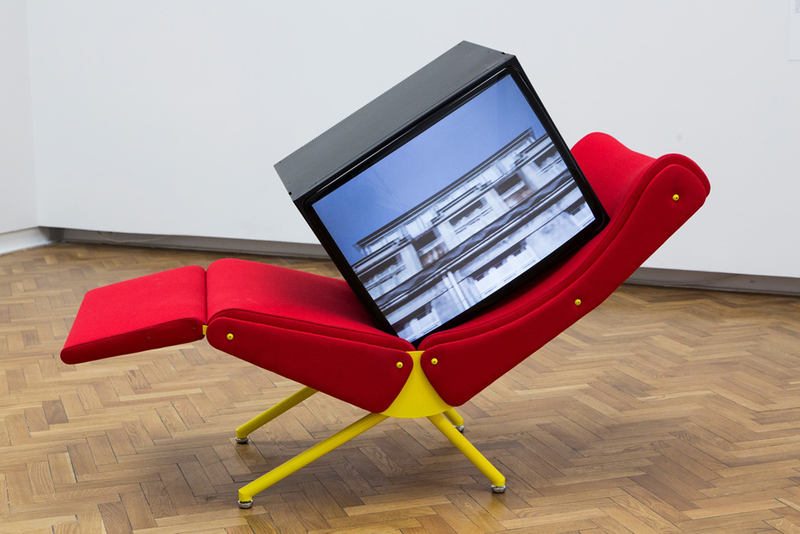 The video played on an CRT screen installed on a chaise longue made in the style of design prevailing in the second half of the 20th century shows Łódź, city of capitalist origin which has many connections with Jasper’s city of residence – New York. The artist, just like a 19th century flâneur, greedily and carefully observes the top floors of Łódź houses. His camera captures the frontage of the streets of a city full of contrasts, signs of past economic splendour and the potential for new development. C.T. Jasper has worked with Joanna Malinowska on several occasions. The most significant collaborative projects include Mother Earth, Sister Moon (2009-2013), a work dedicated to the Polish-American Indian Friends Movement and an opera Halka / Haiti: 18 ° 48'05" N 72 ° 23'01'' W, that was presented at the Polish Pavilion at the 56th Venice Biennale in 2015. The latter took form of a monumental panoramic film projection of the performance of the opera Halka by Stanisław Moniuszko, which took place on 7th February in the town of Cazale located in the Haitian mountains north of the capital. By sending Halka across the Atlantic to show it to the descendants of Polish soldiers from the Napoleonic legions, the artist addressed the question of whether such an export of Polish opera can be something more than a gesture of cultural colonization or promotion. Can an operatic work, practically absent in the international arena, actually have the power to represent national identity? How can such identity be constructed in the 21st century and how can it be translated into other codes? Jasper’s works are part of many public and private collections in Poland and abroad, such as the Museum of Art in Łódź, the Zachęta National Gallery of Art in Warsaw and the collection of ING Polish Art Foundation, the Hirshhorn Museum in Washington. The artist collaborates with Le Guern Gallery in Warsaw. Author: Michał Jachuła, June 2015.